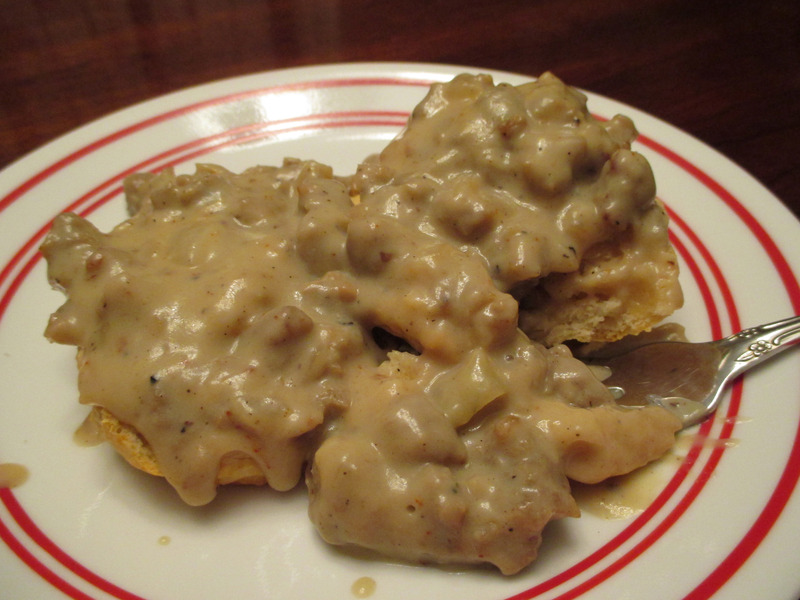 Chances are, if you grew up in the American South, you grew up loving sausage gravy biscuits. 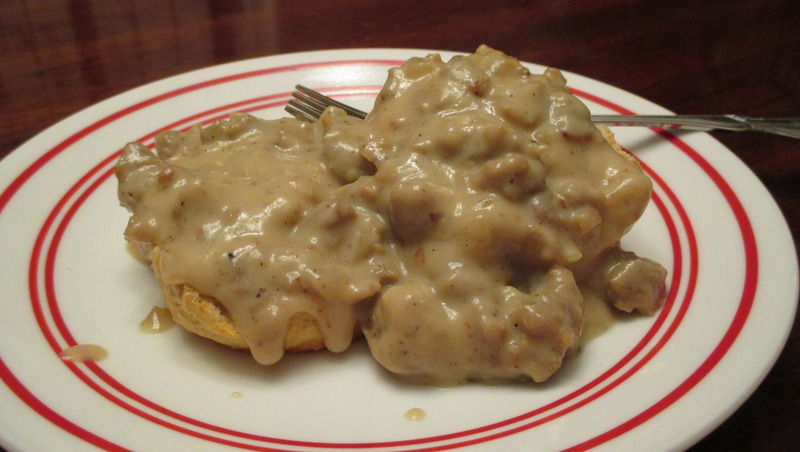 Homemade buttermilk biscuits smothered in rich, creamy gravy with flecks of sausage were a staple at family holiday breakfasts. And those big, nasty, salty, greasy sausage gravy biscuits from McDonald’s? They were a rite of passage for many teens and young adults – the perfect breakfast after a night of partying. Or the perfect cure for a hangover. Or … well, let’s just say if Harold and Kumar had been south of the Mason-Dixon line instead of New Jersey, they would have been jonesing for sausage gravy biscuits, not White Castle burgers. So, now that it’s Autumn and the mornings are getting cooler, it’s the perfect time to revisit this Southern classic – only this time around, they’re vegan and low-fat. Since we don’t make a roux in this recipe, the only fat used is the tablespoon or so of vegetable oil it takes to cook the onions and brown the sausage. This recipe makes about 4 servings (feel free to double or half it), so that means it’s probably about 1/4 tablespoon of oil per serving. 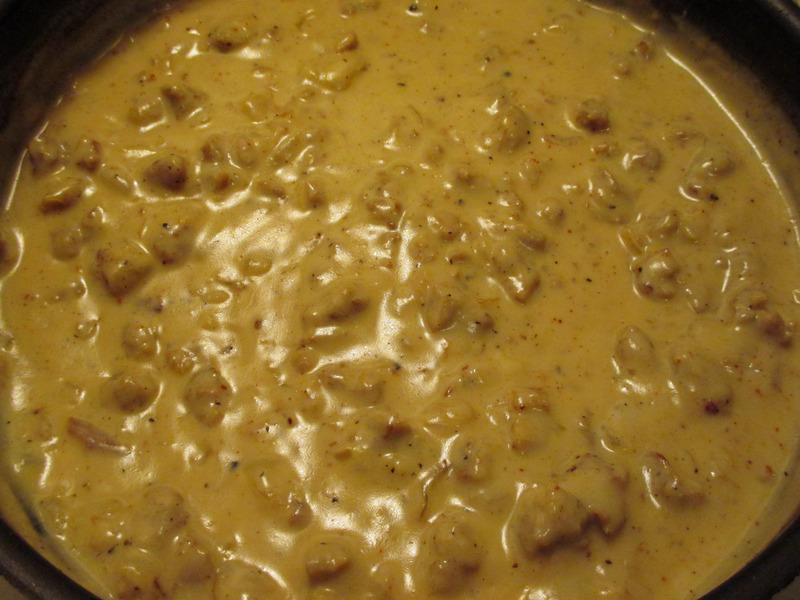 But don’t worry, this thick and creamy, salty, peppery gravy still tastes like it can’t possibly be good for you! Bonus: It’s one of the easiest gravies you can make. Heat the vegetable oil in a large skillet over a fairly high heat. Add the onion and the sausage. The Gimme Lean will want to stick together at first, but as it cooks and “dries out” you will be able to break it into small chunks with your spatula. 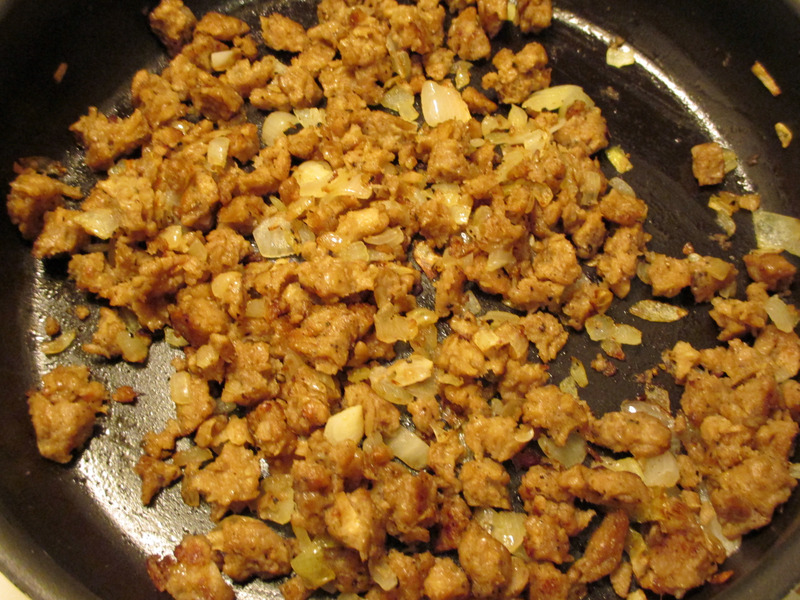 Cook for 8-10 minutes or until the onions are translucent and the sausage has browned. You don’t have to stand over the pan the whole time; the sausage will brown better if you don’t stir too much. Every now and then just gently turn the sausage and onions over, and keep breaking the sausage up into smaller and smaller bits. Reduce the heat to medium and add two cups of unsweetened “milk.” Add salt, black pepper, and cayenne pepper. I’ve listed the minimum amounts; start with those and add more if you need to later. Traditionally this dish is spicy and salty with tons of black pepper – so I always add more salt and pepper and a half teaspoon or more cayenne pepper. That’s just me, however – tailor this gravy to suit you. Add three tablespoons of flour and stir. You don’t need to whisk, but do stir continuously for the first few minutes, so the flour doesn’t clump. After the gravy starts to thicken you can just the gravy a quick stir every now and then while you do other things. It’s ok if the gravy gets a few small bubbles but you don’t want it to come to a boil. It usually takes around 10 minutes for the gravy to thicken; sometimes a few minutes longer. If it gets too thick, add another 1/4 to 1/2 cup of milk. Remember the gravy will thicken once you take it off the heat and it “sits,” so a good rule is to make the gravy just a wee bit more liquid than you think you actually want. Serve over biscuits that have been split in half. What kind of biscuits? To tell you the truth, it doesn’t much matter. You’ll be mainly tasting the gravy, not the biscuit, so there’s no need to whip out your family’s heirloom biscuit recipe. (If you’re not from the American South – yes, families actually do have heirloom biscuit recipes.) I make simple drop biscuits using Bisquik HeartSmart. If you’re lucky enough to find vegan refrigerated biscuits, use those. I know people who even eat this gravy over toast, rice, or baked potatoes. If you can’t find Gimme Lean Sausage, be careful of what you buy. The sausage offerings from many of the major non-meat brands (Boca, Morningstar Farms) are NOT vegan. Also, the fat content in some of the vegan sausage tends to be quite high – why I was so surprised to find out Gimme Lean was fat-free! Use just plain sausage – no fancy flavors like chorizo or kielbasa. Be sure your cooking “milk” is actually unsweetened cooking “milk,” not just plain or unflavored, which can still contain sweeteners. You can substitute 1/2 teaspoon crushed red pepper flakes for the cayenne pepper. Gluten-free people – I’m sorry but this recipe’s just not for you. You can always thicken the gravy with a gluten-free flour, and Bisquick even has a gluten-free baking mix out now. However, every commercial brand of vegetarian or vegan sausage I’ve seen has had wheat ingredients (sorry). Yum! This looks so comforting. Definitely a classic southern dish!